Oh Mighty and Wise One, I have a Kenmore 80 Series dryer. After replacing the igniter, I am ready to put the drum and belt back on, but I have a part, and I think it may be incomplete. In the diagrams I’ve seen online, it shows the idler bracket attached to an idler wheel, which pulls the belt tight. However, mine does not have a wheel – it only has a “C” guide with no moving parts, which would seem to create too much friction. It looks very smooth, like it may have had a belt running over it for ten years, but this just kinda goes against my grasshoppah intuition. Does this look right? Am I missing a wheel or something? (see photo uploaded) Thanks for replies. Yea verily, the Samurai is well-acquainted with the abomination of which you speak (and show in your photo). This was one of Whirlpool’s many brief forays into engineering dementia when they thought they could save a shekel and a half by eliminating the roller on the idler pulley. Net result? Boocoo premature belt failures. Finally, after years on the market and under overwhelming screaming and kvetching from servicers and customers alike, Whirlpool finally caved and went back to the tried and true roller-style idler pulley. 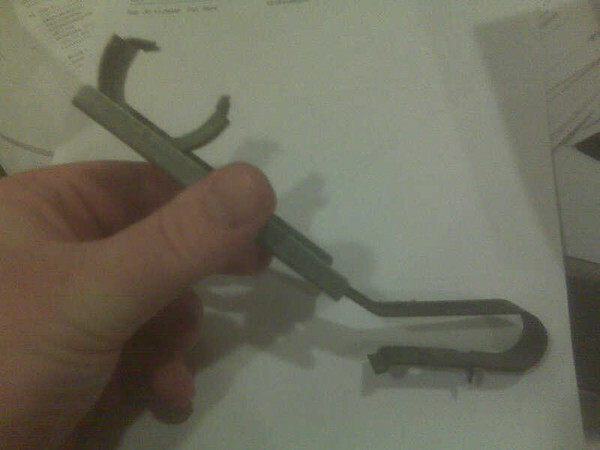 This entry was posted in Dryer Repair on October 1, 2010 by Samurai Appliance Repair Man.